The PAINT BORER 518 MC coating thickness gauge utilizes the wedge cut method in which the specimen is cut at a defined angle. 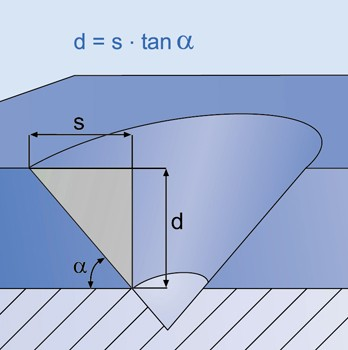 From the projected width of the cut face the layer thickness can be calculated using a simple geometrical relationship. The Model 518 MC limits damage to the coating to a small conical hole as illustrated in the sectional view. 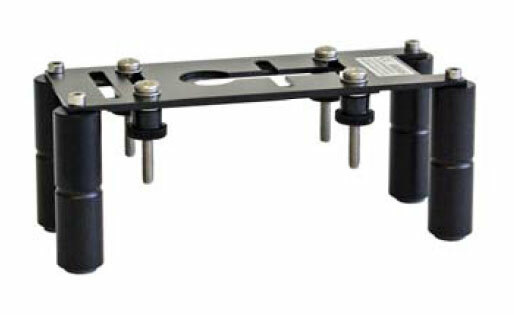 The measuring microscope displays a system of concentric circles and from the difference in the radii the film thickness can be calculated by multiplying with a known factor. 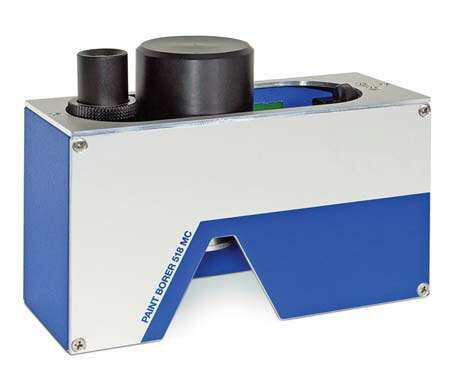 The PAINT BORER 518 MC is a compact instrument having all the principal components; drilling device, measuring microscope, specimen illumination and the battery enclosed in a sturdy housing. A slide moving on horizontal slide-ways houses the drill and microscope and gives the PAINT BORER 518 MC the unique advantage of not having to be moved for measurement after drilling. The drill is spring mounted in the slide so that it can be pressed down onto the specimen with minimum force, the drill is switched on automatically when this is done. The carbide drill bits are easy to exchange and supplied with different accurately maintained cutting angles for 3 standard measuring ranges. 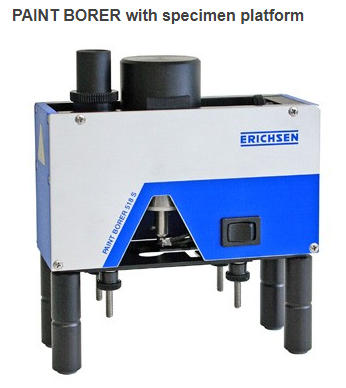 The measuring microscope with a magnification factor of 50 has a measuring scale with 100 lines so that a resolution of 1% is obtained irrespective of the measuring range. The light button on the back of the PAINT BORER can be set for continuous light with three levels of illumination or interrupted illumination to prolong battery life. A 9-volt rechargeable battery is employed; AC operation with the charging unit is possible. Due to the mobility of the microscope in two axes (turned by 90° from one another) and the possibility of turning the scale, the PAINT BORER 518 MC is especially suitable for the evaluation of elliptical holes that arise with curved/ tilted specimens. The coating thickness measurement with PAINT BORER 518 MC is very simple: mark a spot with a felt tip pen and place the measuring instrument on the specimen. Move the drill into position over the test point and lower it to actuate the motor. Drill the coating through to the substrate. Move the microscope over the hole and switch the lamp on. Count the number of scale marks between the base material and the contrast mark and multiply this value by the scale factor which gives the measuring results. 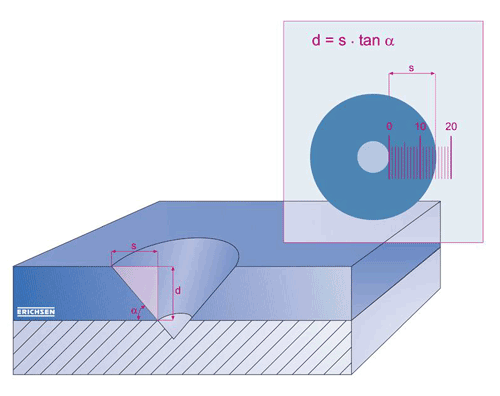 Special applications (individual layers of a multi-layer system, measurements on curved/tilted specimens) are dealt with in the operating instructions.